Today's newsletter is for all of you who are on the go, doing research in the field. Have you tried our ATLAS.ti Mobile yet? If you haven't, I hope that you will download the free app for your iPad or Android device after reading this issue's feature article about how it will support and enrich your research in the field. A great deal of effort has gone into developing these native apps and into making them as intuitive and easy to use as possible. Feedback from early adopters shows us that users really appreciate the convenience of working with these dedicated apps, since they allow them to do actual QDA work far beyond merely “tagging” data. In the words of one Android user, ATLAS.ti for Mobile “facilitates data gathering and coding in the field tremendously.” An iPad user describes it as “a great portable option for first pass quoting and coding of audio and text immediately post-collection.” Some even say they find coding on the tablet altogether easier than on the desktop. Besides being a great mobile tool set for field research and coding on the go, ATLAS.ti Mobile can help students and professors with a number of tasks related to academic writing. 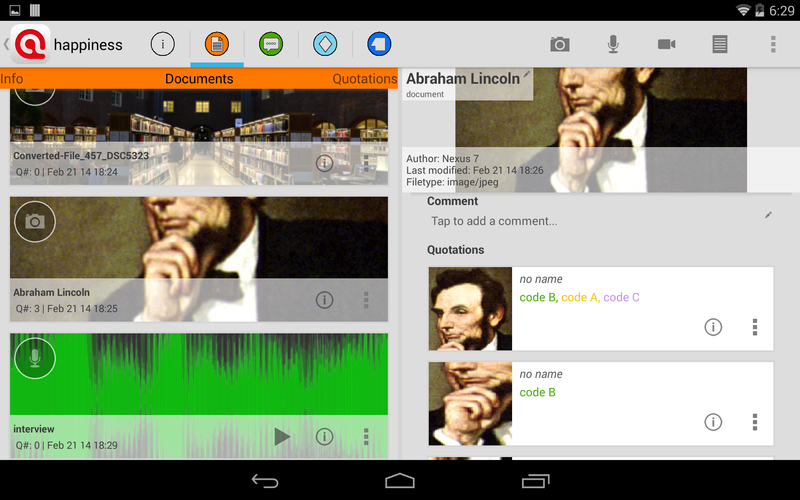 The apps for iPad and Android are particularly well-suited for Literature Review and Concept Mapping. For more information and to try them out for yourself, read the article below and download the free ATLAS.ti Mobile apps. Last year we launched a conference to foster an open dialogue on the key role that ATLAS.ti plays in qualitative research across disciplines and cultures. Encouraged by its success, we are excited to invite you to another great opportunity to meet researchers from all over the world and practitioners from a vast number of fields and industries. Next year's conference will take place in Berlin from August 26 to 28, 2015. Next year ' s conference is still some time away. Why don ' t you get a feeling for what to expect by reading last year ' s Conference Report on qualitative-research.net ? - You can also watch a video that captures the atmosphere. We'd like to invite you to actively participate in our ATLAS.ti User Conference 2015 by becoming a speaker or workshop leader. Your proposals will be crucial to making this event a success. Please watch out for updates and a submission form in the December newsletter. The 2013 conference featured sections on teaching qualitative methods, using ATLAS.ti in the context of various methodological traditions, and focused on the use of ATLAS.ti in actual research projects. ATLAS.ti’s web site has undergone fundamental changes regarding content as well as the general design and has been optimized for a unique user experience. The premise was to develop an overall design approach that would allow visitors to find exactly what they are looking for in the shortest possible time. The website now mirrors the results of intensive usability research at ATLAS.ti and our cooperation with usability optimization experts. "It’s been our primary goal to demonstrate ATLAS.ti’s commitment to very powerful data analysis software that is easy to use. We already applied this very principle in the latest OSX version of ATLAS.ti, and it will be even more visible with the release of the next Windows version, ATLAS.ti 8, that will be published in 2015. By going for a very clean overall design we not only achieved an optically appealing site but also permit the user to find all the information she is looking for as quickly as possible,” says ATLAS.ti CEO Thomas Muhr. ATLAS.ti’s new website is responsive and thus allows users to experience it the same way on mobile devices as well as on desktops or notebooks. With its newly ordered categories and a radical optimization of the site’s structure, our company once again underlines its dedication to constantly challenge the limits of how design and usability can be brought together. Enter our drawing to win one of three ATLAS.ti licenses + Premium Training from an ATLAS.ti expert. Simply “like” the ATLAS.ti Facebook-Page by Dec. 31.2014 (12 p.m. CET), and you will have a chance to win. Have you ever wanted to code on a boat, train, airplane, or in your car? Now you can. ATLAS.ti, the powerful workbench for the qualitative analysis of small or large bodies of textual, graphical, audio, and video data, has received a companion that packs a punch: ATLAS.ti Mobile, available for iPad and Android. These native mobile applications for qualitative data analysis are the first of their kind. With them, you can perform essential QDA tasks wherever you are: Collect and analyze data right in the field and start working with your material immediately. Shoot photos or video on location, take notes, record audio, download text files on your mobile device, and get working on them right away. The same methods and usability paradigms you appreciate in your desktop ATLAS.ti are available, such as highly intuitive coding in the margin area and inside images. Exercise full control over multimedia files, and utilize geo-location data! Once back at the desk, you can seamlessly import your work into the ATLAS.ti 7 desktop version and even merge it with an existing project. (Project export to ATLAS.ti for Mac OS X will be enabled in December.) All your quotations, codes, and memos will be exactly where you want them to be. Overview: What Can These Apps Do? ATLAS.ti Mobile is the perfect tool for working with interviews: Record audio or video on location, capture your thoughts on the interview in a memo, write your field notes, and start segmenting and coding wherever you are. Once you're back at your computer, just transfer your project to the desktop version of ATLAS.ti to fully leverage its tools for analysis, visualization, and team collaboration. These apps make all data collection a breeze. Whether you want to record audio, snap a picture, or film a video — you can do so right from within the app. Once you're satisfied, just assign the file to your project and start working with it. If you've enabled geo tagging or use documents that already contain geographical information, you can even view the location from which those documents originated. 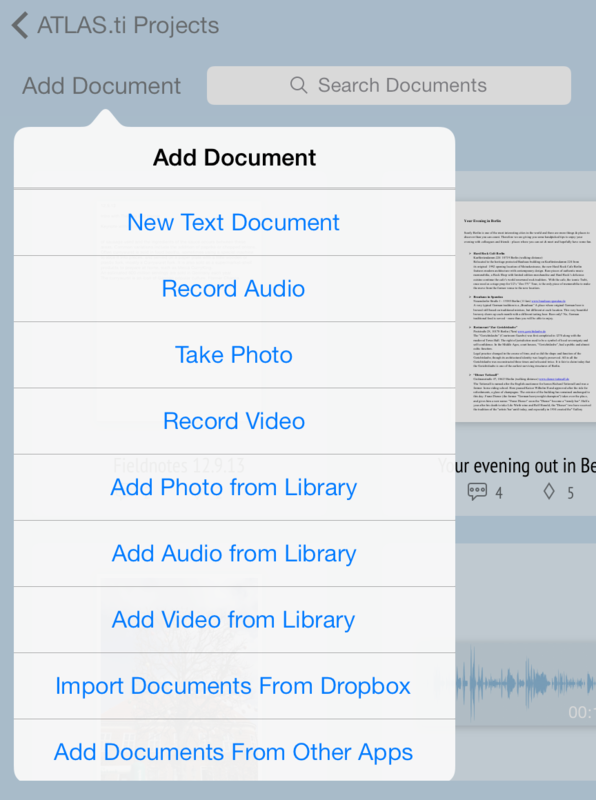 This works for image and video as well as text documents created in the ATLAS.ti Mobile app. Segment and code your documents directly in the app and transfer the project to the desktop versions of ATLAS.ti for deeper exploration and analysis. You can create text, image, audio and video quotations, and link them to codes that can be color-coded according to your preference. You can create text quotations, write quotation comments, create quotations for image, audio, and video content or add codes and code colors. You will intuitively know how to do all of this as the commands are aligned with the touchscreen gestures and behaviors you commonly use. Using the memo feature of the apps is great way to capture immediate reactions and ideas on the go. Writing memos is an important task in every phase of the qualitative analysis process. The ideas captured in memos are often the “pieces of a puzzle” that are later put together in the phase of report writing. Theory-building, often associated with building networks, also can involve the use of memos. 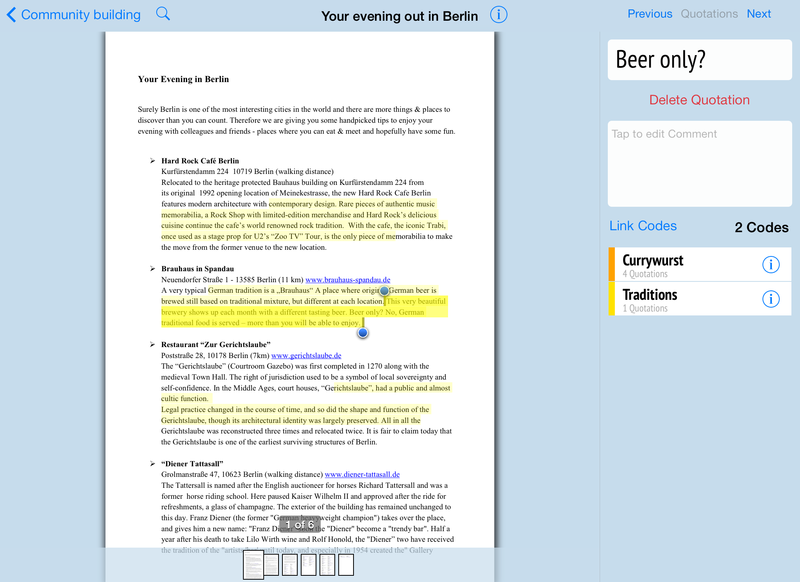 In short, memos are fantastic tools for your QDA project and a very helpful project device. Among other things, you can use them to take methodological notes, keep a “bulletin board” for team projects, and provide space to write up your analysis. These apps were designed to be really easy to use and as intuitive as possible. Just download the app for your devices and give it a go. Some of the steps must be taken in sequence. For instance, the first step should be to create a project that serves as an “idea container.” This should be followed by adding documents into the project. Next, you begin noticing interesting things in the data, commenting them, segmenting the content of the document, or coding it. But other than that, there are no strict rules and you can map your own path. Once you are ready to take the project to the next level of QDA analysis, just export it to the desktop version of ATLAS.ti. There, you can group your documents in families, sort and structure the code list, ask questions of different levels of complexity using the various analytical tools available, and build semantic, prepositional or terminological networks with the codes you have created earlier. If you have any questions, ATLAS.ti provides a series of free resources including frequent free webinars and video tutorials (currently only for Android available) that you can access or sign up for. Our trainers are also always happy to answer your questions. Just send them a note at [email protected].